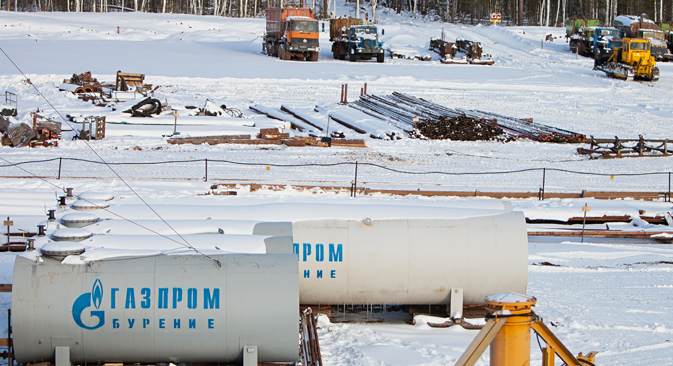 The Russian gas giant Gazprom has announced a serious loss of revenues for the third quarter of 2014. In particular, the company's EBITDA fell more than by 40 percent as the producer saw a drop in gas sales to all its buyers, including EU countries, former Soviet republics and domestic customers. The ongoing conflict in Ukraine and the attendant sanctions imposed on Russia also have an influence on the situation within the company. Russian gas behemoth Gazprom saw a drastic slump in its revenues for the third quarter in 2014, according to the company's accounts, published on Jan. 30. Gazprom's earnings before taxes at the end of the first nine months of 2014 declined from 1,097 trillion rubles ($15.75 billion) to 756.9 billion rubles ($10.86 billion). However, considering the ruble's loss of more than 50 percent of its value against the dollar and euro since fall 2014, the real decline of the company's dollar earnings was much more serious, since the energy exporter receives a large part of its revenues in the foreign currency. Gazprom saw a reduction in demand for gas from all its buyers, including EU countries, former Soviet republics and domestic customers. The volume of gas for European customers declined from 126.8 to 122.5 billion cubic meters, while supplies to the former Soviet republics fell from 42.2 to 36.7 billion cubic meters. Meanwhile, Russian consumers are buying 157.9 rather than 170.8 billion cubic meters of gas. Third-quarter results showed that the company's debt burden had increased by 14 percent, even though this is mostly related to short-term credit. Due to the sanctions imposed by the West (over Russia’s backing for rebels in eastern Ukraine) the company has been practically deprived of the opportunity to attract the long-term credit that is needed for the strategic projects to construct gas pipelines to China (the Power of Siberia pipeline) and Turkey (Turkish Stream), experts say. "The indicators are indeed getting worse, which is related to macroeconomic trends, the decline of domestic demand and the freezing of domestic tariffs, decline in supplies to Europe and the cessation of supplies to Ukraine," says Ilya Balakirev, chief analyst at UFS IC. At the same time, according to Balakirev, the results could have been worse - after all, the decline in supplies to Europe has helped reduce transit costs. Dmitry Baranov, a leading expert at Finam Management, is similarly phlegmatic in his assessment of the economic situation, pointing out that “with the way things were going in the country and in the world last year, it is doubtful that the situation would have been ideal." As for the future, Balakirev does not see reasons for particular optimism for the Russian gas giant. "The 2014 results will probably demonstrate a loss for Gazprom due to the weakening of the ruble," says Balakirev. "The company is continuing to lose a share of the European market because of its inflexible price policy, and there is a fear that long-term contract prices, which are tied to oil prices, will fall." The ongoing gas dispute with Ukraine also has an effect on Gazprom's position. And with - according to the company's accounts – hearings of the counterclaims of Gazprom and Ukrainian state oil company Naftogaz at the Arbitration Institute in Stockholm to begin no earlier than the beginning of 2016, the two sides will have to negotiate gas prices for at least another heating season. Gazprom is demanding that Ukraine pay its $4.5-billion debt, a part of which has already been paid off. Russia says that the remainder of the debt is currently $2.44 billion, including penalties. In turn, Naftogaz of Ukraine is demanding a retroactive reduction in gas price from May 20, 2011 and a return of the overpayment. Furthermore, Naftogaz insists that it be compensated for the insufficient volumes of transit in 2009-2013. The overall sum that Ukraine is demanding is $6.2 billion. According to Dmitry Baranov, the sides will have to negotiate for another year without the participation of the arbitration institute, which means that conditions for gas supplies and payments for 2016 may change. Ilya Balakirev says that everyone still hopes that the sides will be able to resolve the issues without going to court, since the quarrel is essentially one of a political nature. "The winter has shown that Ukraine does not have a real alternative to Russian gas," says Balakirev.